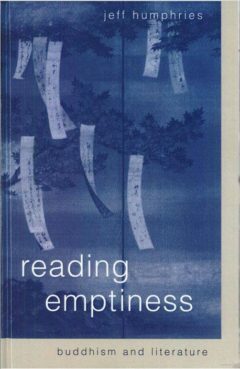 Reading Emptiness: Buddhism and Literature (1999), by Jeff Humphries. I love this book. It’s written in favor of literature as an approach to realizing emptiness. Literature is our tantra in the West, he says. Reading literature is not a matter of getting caught up in words, for literary truth is in the act of reading, not the content. Literature, especially when we read it with this kind of approach in mind, helps counteract reification and the conception of objectivity.